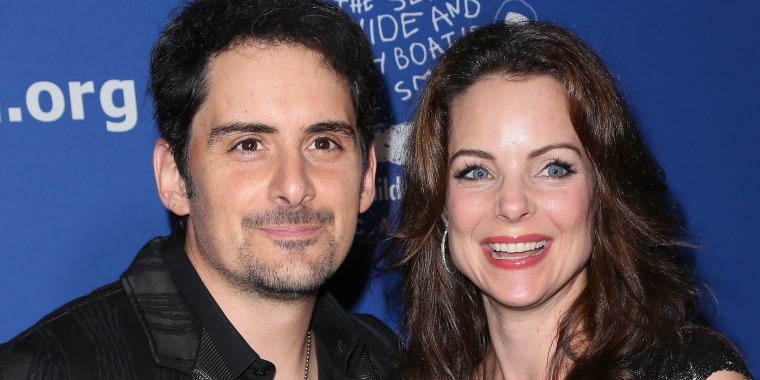 Country music star Brad Paisley and his wife, actress Kimberly Williams-Paisley, are spearheading the development of a new grocery store in Nashville, Tennessee. Brad and Kimberly Williams-Paisley join in with the crew as work begins on "The Store," a new grocery store where referred families can shop free of charge. Paisley helped break ground for the project on Wednesday, getting behind the wheels of a backhoe to clear the way for "The Store." Brad Paisley operates a backhoe, while breaking ground for "The Store." In a groundbreaking ceremony, Paisley said "I think it's gonna be really interesting to see what this looks like when we're done, not just in building form, but in how it works and so much of that is going to come down to the fact that we have such a generous partner in Belmont giving us this opportunity that not only will these people be served but they will be served by students, for the most part." Paisley spoke at the groundbreaking ceremony for "The Store" in Nashville, Tennessee. Unlike an ordinary supermarket, "The Store" will be devoted to helping people in need to shop for much-needed healthy food. In October, the couple announced that it teamed up with Belmont University, which is Paisley's alma mater, to create "The Store." The store will allow families who are referred by nonprofit and government agencies to shop at the grocery free of charge for one year. Unlike receiving a bag of food they may or may not need from a food bank, shoppers at the store will be able to select nutritious items they need. Second Harvest Food Bank of Middle Tennessee and other organizations will provide the food to the shop. All of the foods at the store will meet dietary guidelines created by dietitians from the food bank. The couple was inspired to develop the concept after volunteering with their two children at the Unity Shoppe, a 100-year-old free grocery store, in Santa Barbara, California. “At Belmont we believe that the greatest privilege that anyone can ever have is to be in a position to help and serve another person," Belmont University president Dr. Bob Fisher told TODAY Food in an email. "Brad and Kim are living out that mission in an extraordinary fashion in every aspect of their lives, particularly through the creation of 'The Store.'" Belmont University donated the property for the project and The Store will be located at 2005 12th Ave. S., next to the University’s Ministry Center and close to local bus routes. ESa (Earl Swensson Associates), the largest architectural firm in Nashville, donated their services to design "The Store." The Paisleys hope to eventually expand services provided by "The Store" to include job training, as well as cooking and nutrition classes. For more information, visit TheStore.org.